Structure opened its doors a couple of days ago. 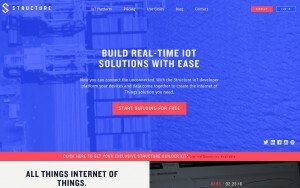 Structure offers a simple and powerful IoT cloud platform for developing the next generation of connected experiences. They offer device management with robust data visualization that reacts in real-time. They have a nice drag & drop workflow interface that allows you to forward data coming in, combine data or just store it. I will be testing a builder kit with the platform, that includes the Adafruit Feather Huzzah, which offers native Wifi connectivity. My Raspberry Pi’s will also find their way into the system. The platform allows to consume REST Apis as well, that will make it even more fun to build something unique.